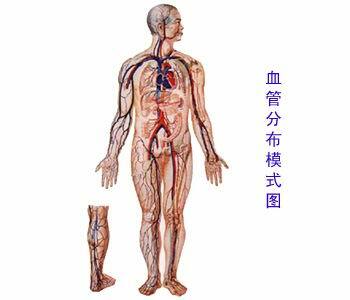 The vessel system including the arteries pipe system and the lymphatic system, is a set distributes in the whole body each place solid surrounding boundary. The arteries pipe system is composed of the heart and the blood vessel, the blood vessel includes the artery, the vein and the blood capillary. 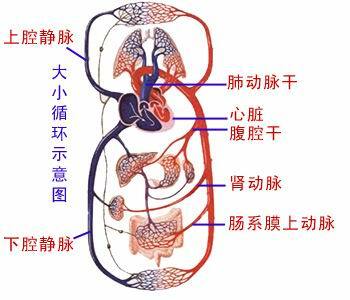 The heart is impels the blood stream the power organ, divides into four cavities. Namely left and right atrium, left, right ventricle. The artery is carries over the blood heart's blood vessel. The vein is brings back the blood heart's blood vessel. The blood capillary is links between the artery and the vein the caliber is extremely thin, the pipe wall extremely thin blood vessel. The blood embarks by the ventricle, after the artery, the blood capillary, the vein returns to atrium's process again and again, calls the blood circulation. Also divides into the body circulation and the pulmonary circulation. Left ventricle -> aorta -> all levels of artery branch -> whole body blood capillary -> vein -> all levels of veins are -> on, the vena cava inferior -> right atrium. Around the right ventricle -> pulmonary artery -> pulmonary artery all levels of branch -> pulmonary alveolus the capillarity network of bloodvessels -> pulmonary vein is the -> pulmonary vein -> left atrium.